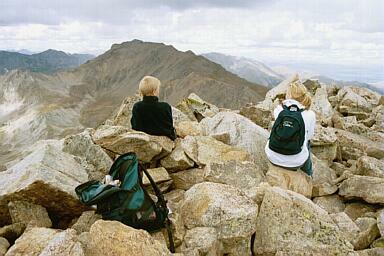 How to get there: The access road starts out in Buena Vista, see Mount Harvard. Route description: See the description under Mount Harvard. Comments: My son Pål Jørgen (11 years) and Jenni Søbstad climbed this route with me. 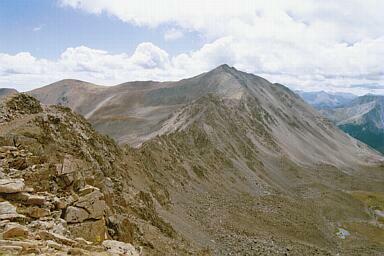 We climbed this mountain from Rabbit Ridge, coming from the summit of Mt. Harvard. The first part of the ridge descending from Mt. Harvard is very pleasant, passing a distinct rock spire to the right (west). The ridge itself (the low section) is quite entertaining in places, with slightly more difficulty the closer to the (top of) the ridge one tries to stay. Beware of some rotten rock near the rabbit itself. There are two main rock formations on the ridge that cannot easily be climbed, both can be passed on the left (east) side. 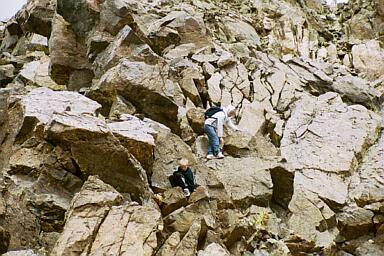 The first formation requires dropping off the ridge to the left, however only to the base of the almost vertical rock. 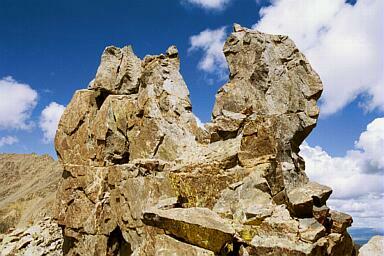 (There are numerous traces of climbers that have decended much further down.) 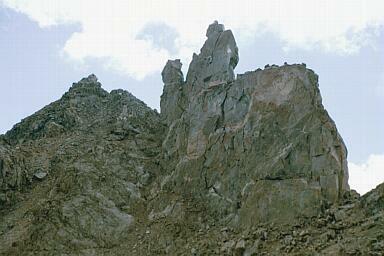 The second rock formation is the characteristic rabbit itself. We climbed up a small gully on the left (east), right next to the vertical rabbit wall. 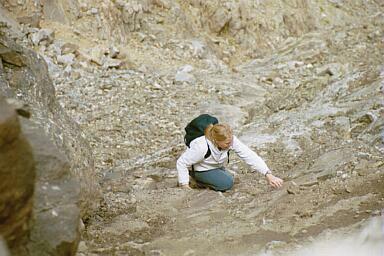 This gully has loose rock and one should do it one at a time in order to avoid rocks hitting climbers below. Once at the top of this passage, the ridge can be followed on the very top the rest of the way with good rocks/stones. In fact, one arrives on a very nice grassy section ending in the final summit ridge, again with good footing among larger rocks. Mount Columbia as seen from the summit of Mount Yale, April 29. 2001. 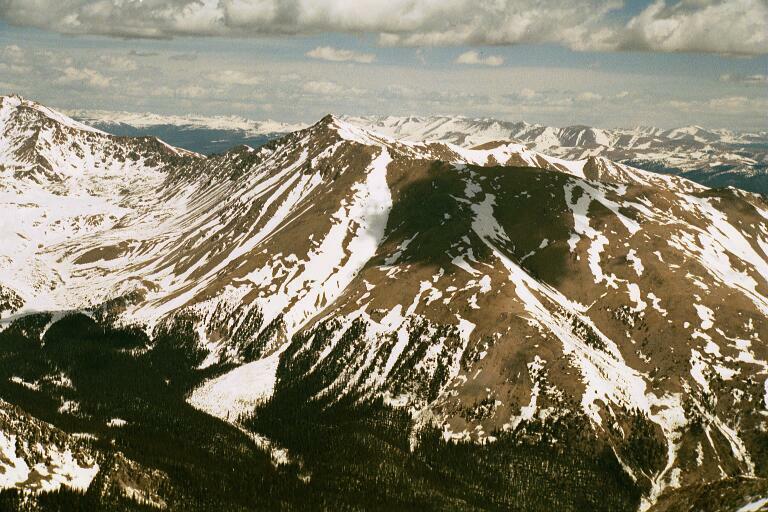 Rabbit Ridge and part of Mount Harvard to the left. 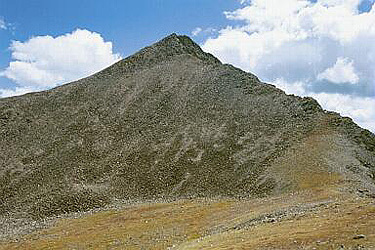 Rabbit Ridge connecting Mt. Harvard to Mt. Columbia. Rabbit Ridge first part, descending to the lowest point. The Rabbit we climbed the gully on the left side. Jenni climbing the gully past the Rabbit. The Rabbit Ears seen from the top of the gully, Mt. Harvard in the distance. 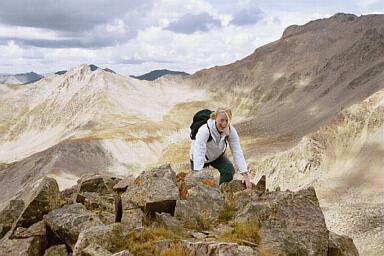 Jenni climbing the last part of Rabbit Ridge, the standard route to Mt. Harvard is seen behind her. Mt. Columbia final approach from Rabbit Ridge. This last part of the ridge is easy to climb. Mt. Columbia on the summit.